It has been some time since the reality star and basketball player called it quits on their tumultuous relationship, but they remain committed as ever to co-parenting their 1-year-old. And True's birthday celebration on Sunday certainly proved that the parents are more than capable of coming together for the sake of their daughter. "Khloe was very happy that Tristan showed up," a source tells E! News. "The day was a success and drama free." Another source acknowledges that the party was a "difficult place for Tristan to walk into," so the fact that the basketball player came made Khloe "very happy for True." However, the Good American designer deserves a fair bit of credit for creating a welcoming environment for her ex. The second insider reveals, "She asked everyone to not make it uncomfortable for Tristan and to just focus on True and this beautiful celebration." "Khloe has had to make many sacrifices for True and she will continue to. She knew Tristan had to be there for True's first birthday and it would mean coming together with her family. She wanted to make sure there was no drama," the second source adds. "She made that clear to her family." And it appears that her family was more than willing to oblige. The first insider explains, "Everyone brushed their issues under the rug and put on a good face for True." 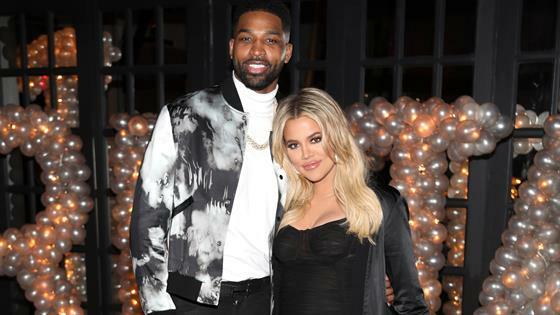 While Khloe and her family were "civil" with her ex, the second source says, "Khloe and Tristan didn't talk much... They hung out separately for most of the party." Luckily, according to the first source, Khloe "allowed him to bring a few friends so he didn't feel out of place." Between spending time socializing with friends and doting on True, Tristan was "in a great mood and was truly showing effort to be there and be involved," describes the same source. Overall, the celebration has been deemed a success. The second insider shares, "Khloe and Tristan came together for photos and birthday cake. If there was a big moment they were both in it for True. That is all that Khloe wanted. She wanted to make sure that when True grows up and looks back on this she can see that both of her parents were there for her."